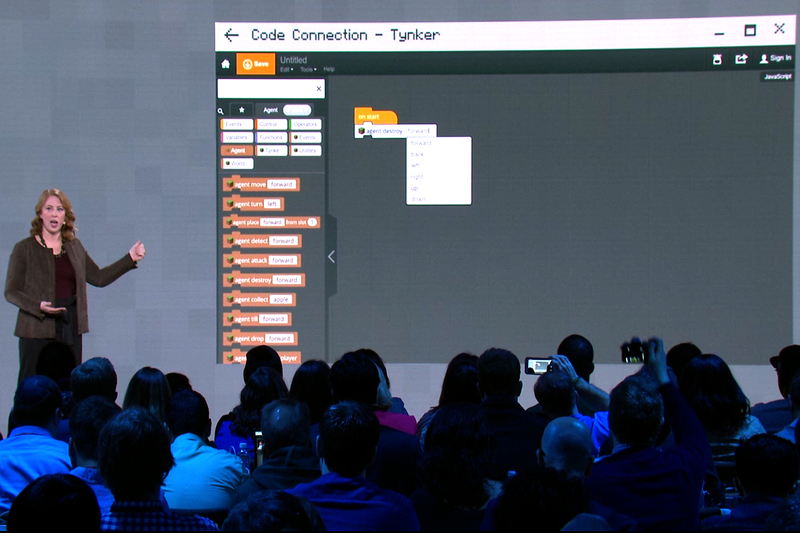 With Code Builder, Minecraft players are joined by an “Agent” character that serves as a sidekick and carries out the coding commands. This sidekick can essentially build anything in the virtual Minecraft world, from 3D printed objects to huge, historic architectures like the Globe Theater in 16th-century London and the Parthenon. For instance, when using ScratchX, players can grab a handful of single-line commands, place them in the ScratchX window, and lock them together. Thus, to have the Agent move forward three steps and till the soil for farming, the player would string together three “move forward” commands and one “till forward” command. As a refresher, Tynker is a tool that teaches computer programming for students aged seven and older. Tynker includes visual code blocks for stacking code together, tools for creating Minecraft mods, programming drones, and creating multi-level arcade games. Meanwhile, ScratchX is a tool based on the visual programming language Scratch and is mostly used to test “experimental” Scratch-based features (aka Experimental Extensions). Microsoft introduced MakeCode in March, which interacts with physical computing devices like the micro:bit board. In addition to introducing Code Builder for Minecraft: Education Edition, Microsoft’s Megan Saunders talked about bringing mixed reality into the hands of students. In one demo, Amy Henson demonstrated how to create the Earth and moon rotating around the sun in Paint 3D. The goal was to show how a solar eclipse works and she eventually dropped the scene into PowerPoint and generated transitions to animate the eclipse-creating scene. In another demo, Henson pulled a virtual model of NASA’s Curiosity rover into the Microsoft Teams client. She then used a Surface tablet’s built-in camera to shoot live video of Saunders standing on stage and dropped the Curiosity model into the scene. Coming this fall on Windows 10 as Viewed Mixed Reality, the upcoming feature demonstrated how a virtual seven-foot Mars rover can scale appropriately next to a five-foot, eleven-inch human. Next, Henson placed Acer’s upcoming mixed reality headset on her head to show how it can be used in the classroom. She took a trip into the future to view the solar system in the year 2492, a period when all eight major planets will be in their closest proximity to each other. That last time this planetary gathering took place was around 1,000 years ago. Finally, Saunders said that Pearson Education is injecting 3D and mixed reality into its secondary and university-level curriculum. Pearson will offer courses in Commerce, History, Health, and STEM. Thus, in the 2018 school year, any student can take any course under the four groups using any Windows Mixed Reality device. The headsets will arrive during the 2017 holiday season for a starting price of $299. Microsoft’s mixed reality strategy seems stalled, but is it all part of the plan?